Book your sitters and dust off your curlers! 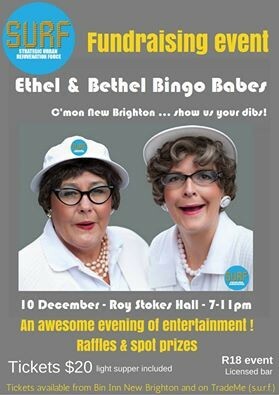 This will be an awesome evening of entertainment with Ethel & Bethel Bingo babes! And all helping New Brighton help itself. 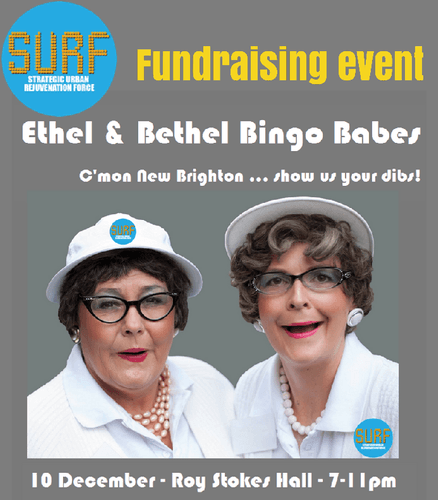 Tickets on sale at Bin Inn New Brighton and on Trade Me (link below). This is an R18 event with licensed cash bar operating. This is a Fundraising event for S.U.R.F. Community Trust's 28 Day Projects. It is also raising funds for Christchurch Circus Trust. During the evening we will have a wide variety of awesome raffles, giveaways, and auctions for you to participate in and have some fun!